We recently covered some of our favorite in-store experiences at SXSW but we also loved the focus on technology's ever-evolving role in in retail. The Style & Retail track specifically highlighted how retailers are using technology to connect to consumers. Here are some highlights of the conversations around Sustainable Fashion & Tech, AI in Retail, and the future of Connected Beauty. The desire to focus on sustainable fabrics and support responsible consumption is growing in the fashion industry. There's more of a movement to source local fabrics, be more mindful about the local environment when creating garments (for example, not leak dyes into local streams) and re-use fabrics that would otherwise be discarded. We like the emergence of new initiatives like Marine Layer's 'Re-Spun' program. Each year, the average American throws away an estimated 80 pounds of clothing. Re-Spun is taking aim to reduce that textile waste. The program is designed to create a closed-loop production process, encouraging customers to turn in their old tees so that Marine Layer can break the fabric down and re-spin it to create entirely new t-shirts. It's a relatively new advancement in fashion production and one that we can see consumers - especially Gen Z - getting behind. Another company focused on sustainable fashion practices is Finery. Co-founded by model and actress Brooklyn Decker and former news anchor Whitney Casey, Finery attempts to digitize and organize users' wardrobes. The goal? To help curb 'throwaway' fashion culture and reduce waste by inspiring customers to wear what they already own. Wearing a piece of clothing 50 times instead of five reduces the amount of carbon emissions by 400% per item, per year. That's no small stat. Retail is starting to play a larger role at SXSW. This year, we saw more brand executives emphasize the importance of the in-store experience and ensuring those experiences not only align with the brand, but meet customer expectations and demands. In-store activation wasn't just limited to speaker sessions or panel discussions. Retailers showcased their Austin-based physical locations with thoughtful and engaging programs. Here are a few examples we loved. Aviator Nation first launched in 2006 by Paige Mycoskie. The clothing brand was born out Mycoskie's love of 70s-inspired clothing, live music and the arts. She launched her collection out of her garage in Venice, California where her friends could also come and play music. The brand grew in popularity and now all eight of her brick and mortar stores still embrace that same ethos. Every Aviator Nation location embraces live music and ongoing events that cater to the creative and musical desires of each market. Mycoskie credits the fact that the musical acts can still be viewed for free by customers as one of the keys to the success of her stores. She emphasizes that the in-store experience is authentic to her brand and therefore, resonates with her customers. True to form, during SXSW, Aviator Nation's Austin-based location hosted a mural painting party, sound bath sessions, yoga and live bands during the festival. Kendra Scott is based in Austin, so it's no surprise that it would welcome SXSW with open arms. Kendra Scott specializes in jewelry and accessories, focusing especially on gemstones. 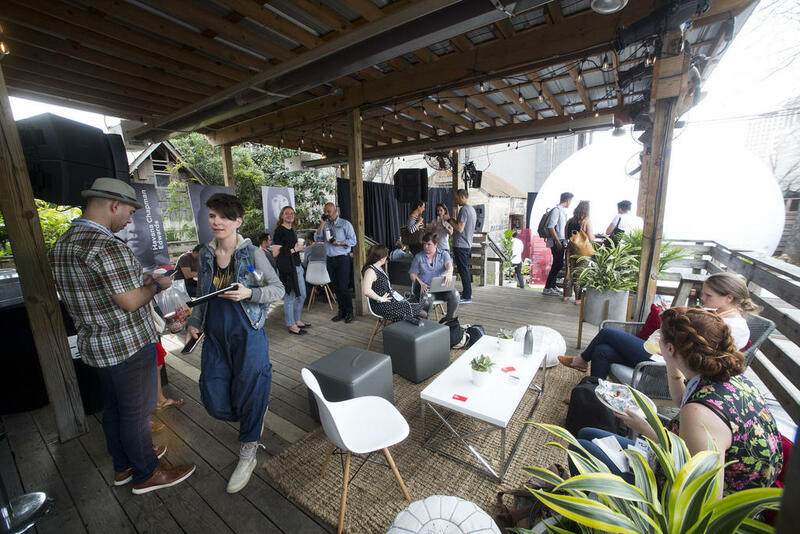 Realizing the power of brick and mortar stores, Kendra Scott opened a new flagship location in Austin's popular 'SoCo' district (South Congress) and welcomed retailers with a Style & Retail Party at the start of SXSW.